A summer salad with red and yellow bell peppers, chickpeas, fresh oregano, and basil! 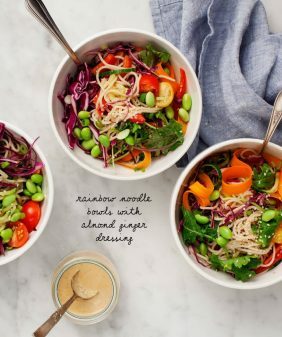 A simple & healthy weeknight dinner for vegans and meat eaters, too. While I might have brought home a few new ideas, I also brought home probably a few extra pounds. So this week is gonna be a healthy one. Yesterday we went to the farmers market and loaded up on fresh vegetables. Light, simple, refreshing food is on the agenda (along with some pilates). Slice the peppers into quarters, removing the stems and seeds. Toss with a bit of olive oil, salt, and pepper. Grill peppers, a few minutes on each side. Let cool and chop into ½-inch pieces. Make the dressing: whisk together the garlic, vinegar, olive oil, mustard, and pinches of salt and pepper. Taste and adjust seasonings. Set aside. 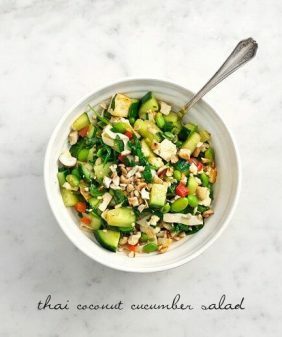 In a large bowl, toss together the grilled peppers, cucumber, chickpeas, basil, oregano, shallot, pine nuts, cheese, if using, and as much dressing as you like, tasting as you go. 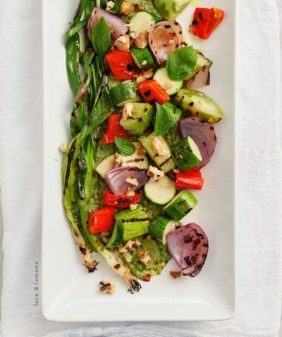 This salad is best if you let it sit for 20-30 minutes in the fridge for the flavors to develop. I am in need of a clean eating week too – the past few weeks have been so hectic with travelling for work and family gatherings, back to the basics for us too! 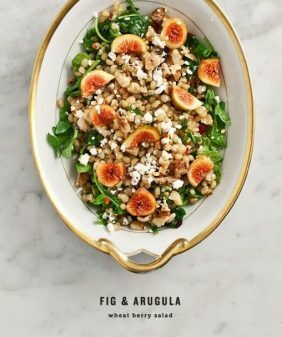 I am thinking I will be enjoying this salad for dinner and lunch this week! 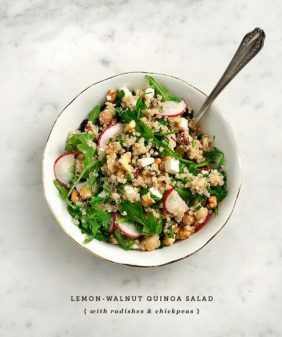 I use the ‘research’ excuse a lot, you are definitely not alone 😉 The thing I love about this salad is that it doesn’t feel like you’re eating ‘healthy’ or ‘clean’ or whatever, just that you’re eating something delicious. 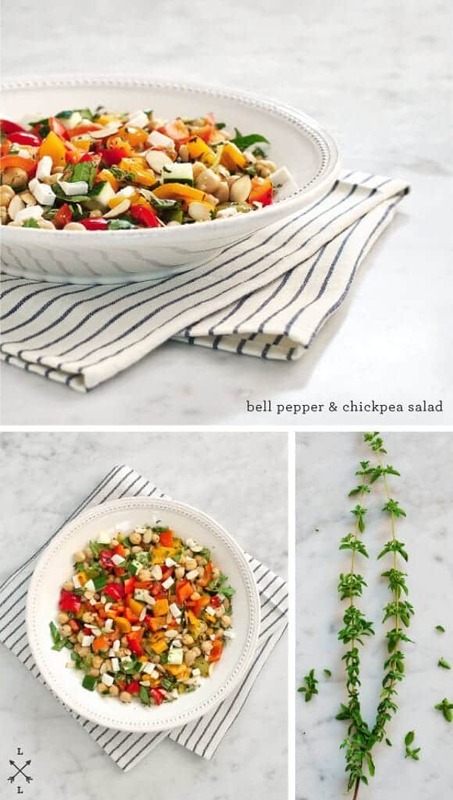 Bell pepper and chickpeas sounds like a great, refreshing lunch combination. Thanks for the terrific idea! I love using chickpeas as the protein in a dish. 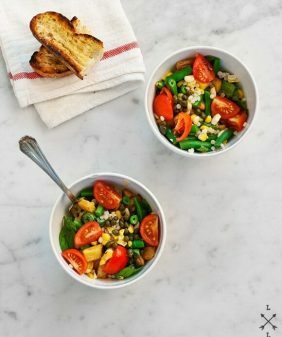 This looks fantastic for a light summertime dinner. Thanks! Chicago is tops on our list of cities we want to visit so that we can eat ourselves silly. Balance is good; it sounds like by the end of this week everything will be on kilter again. As a (somewhat professional) foodie in Chicago I am always happy to give recommendations! There is a picture of Thyme in the post, but not in the recipe. Should there be thyme? I have a lot in the garden! thanks! It’s actually sicilian oregano (that I have tons of in my garden), but fresh thyme would work too if that’s what you’ve got. Very colourful, summery and delicious! Made this tonight, with feta instead of ricotta salata. I will definitely make it again–delicious! so glad you liked it, thanks for sharing! this looks so, so delicious! healthy is just an good excuse to “need” to eat these foods. YUM! Thank you! I absolutely love meals that I can throw together in 10 mins with stuff I already have in the pantry/fridge. This was a lovely lunch, enjoyed on the front porch watching my dogs play in the yard. Perfect break from work.